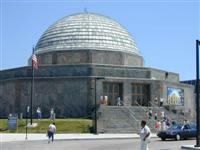 Located on Lake Michigan, the Adler is America's oldest planetarium, and boasts two full-size planetarium theatres. Visitors and locals alike have marvelled at the night sky in the historic Sky Theatre since 1930. It now feature the all-digital StarRider Theatre which is the first of its kind in the world and affords a virtual outer space experience in its 55-foot (17m) wide and three-storey high area. The Adler is also home to numerous exhibits including antique astronomical instruments dating back to 12th-century Persia as well as fun interactive displays. The Adler hosts many special lectures and events and a visit is an absolute must for star-gazers. It is a good family attraction in Chicago as the shows enchant all age groups and much of the programme is carefully designed for children. Opening times: Open daily 9.30-4pm.